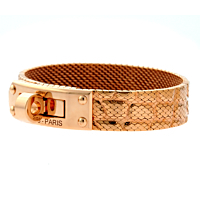 A stunning 18kt rose gold mesh bracelet by Hermes from the Kelly collection. 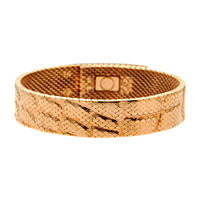 This stylish and flexible Kelly bracelet is adorned with a subtle link design and finished with a rectangular rose gold plate, unique with its own tiny hardware. A chic twist lock and Hermes Paris stamped lettering finishes the polished look.